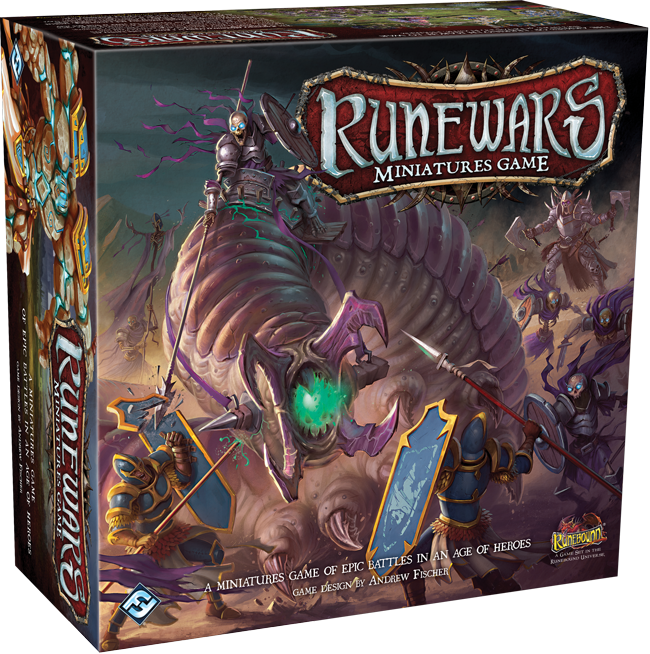 Take command of your army in Runewars Miniatures Game, a miniatures game of epic rank-and-file battles for two players, set in the vibrant fantasy realm of Terrinoth. In every game, you and your opponent must duel for position, commanding your units and carefully maneuvering to destroy your opponent on the field of battle. The realm is yours for the taking. You’ll carefully choose exactly how you want your units to act at the beginning of each round in a game of Runewars. Each unit features a corresponding command tool, which is made up of two dials. 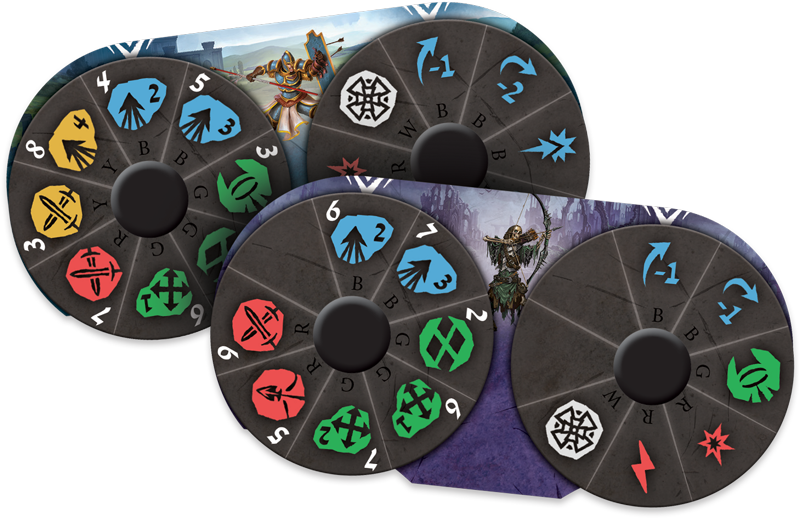 The action dial determines how your unit will act—whether you send your spearmen charging into the fray, fire a volley of arrows from afar, or wheel in position to set up a stronger attack. The modifier dial, on the other hand, allows you to carefully tailor your action to the current battlefield. You may boost your defense, increase your attack power, rally your troops, or even gain additional actions. 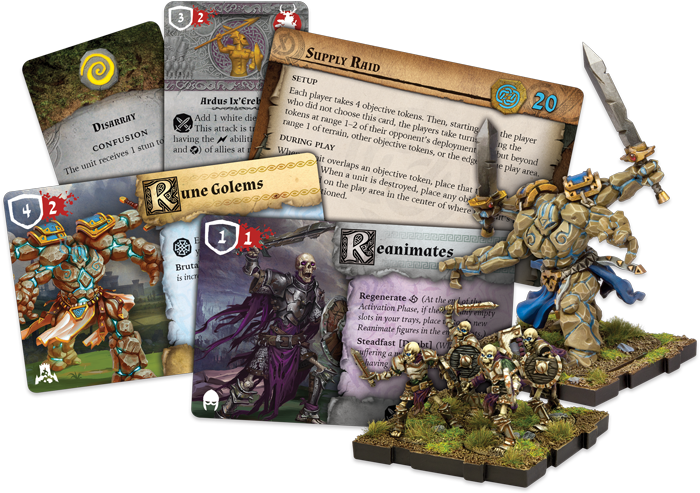 Every unit in a game of Runewars features entirely different action and modifier dials, which means that commanding a horde of Reanimates feels very different from sending a Rune Golem forward in a maddened assault. You’ll need to carefully learn your units’ capabilities if you’re going to command wisely and anticipate your opponent to destroy him in battle. 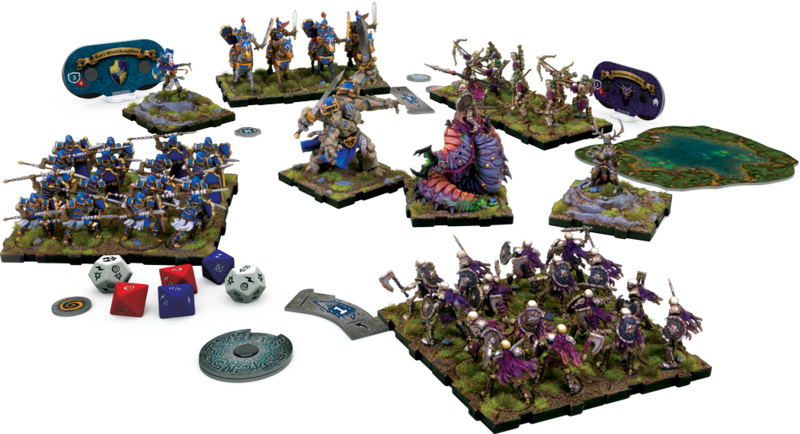 In a game of Runewars, you’re not just overseeing a small band of warriors skirmishing over contested ground. You are the general leading a massive army, composed of individual unit blocks, and the sweeping scope and scale of the game quickly draw you into the action. Of course, even once you’ve chosen your side, there are still dozens of ways to customize your forces. You’ll be able to choose the distinct shape of each unit in the battlefield, determining the width and depth of their formation—with potent consequences for your unit’s efficacy in battle. Upgrade cards can be assigned to your units, giving them special abilities as you raise the heraldry of your nation or equip better armor. And because all Runewars figures come unpainted, every new figure is a blank slate for you to paint, customize, and forge an army that only you could have made. The fate of Terrinoth rests in your hands.